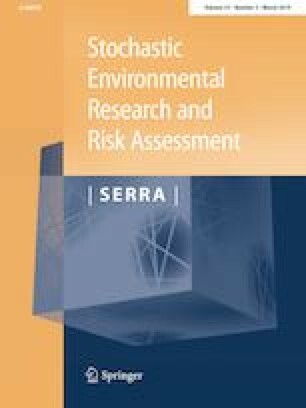 To expand the applicability/versatility of multiple-point geostatistical (MPS) methods to the unevenly distributed sample data acquired from geological and environmental surveys, this paper presents a conditional MPS-based simulation method which considers the distribution characteristics of sample data adequately. In this work, we mainly focus on the improvement of two key steps in MPS methods, i.e. the selection of simulation paths and the construction of data events, aiming at mitigating the adverse effects of unevenly distributed conditioning data. First, a simulation path sensitive to the distribution density of informed samples is adopted to ensure that each simulation of the unknown nodes in a simulation grid is done from the location with the highest density of informed nodes around. Second, a stable data event is obtained by evenly extracting several informed nodes closest to the current node from each subarea. This improvement avoids the excessive concentration of the nodes in a data event, so that the nodes in an obtained data event are more evenly distributed around the current node. The two improvements are embedded into a widely used MPS method, the direct sampling. Several 2D and 3D synthetic experiments with categorical or continuous variables are used to test the proposed method. The results demonstrate their applicability in characterizing heterogeneous phenomena when faced with unevenly distributed conditioning data. We are grateful to editors and three anonymous reviewers for their insightful comments and suggestions which led to the improvements in the manuscript. This work is supported by the National Natural Science Foundation of China (U1711267), the Fundamental Research Funds for National Universities, China University of Geosciences (CUGCJ1810) and the project of Ministry of Education Key Laboratory of Geological Survey and Evaluation (CUG2019ZR03). The authors wish to thank Gregoire Mariethoz and Alessandro Comunian for the fruitful discussions.